If anything, 2014 will be known as the Year of the Mash-Up for me. 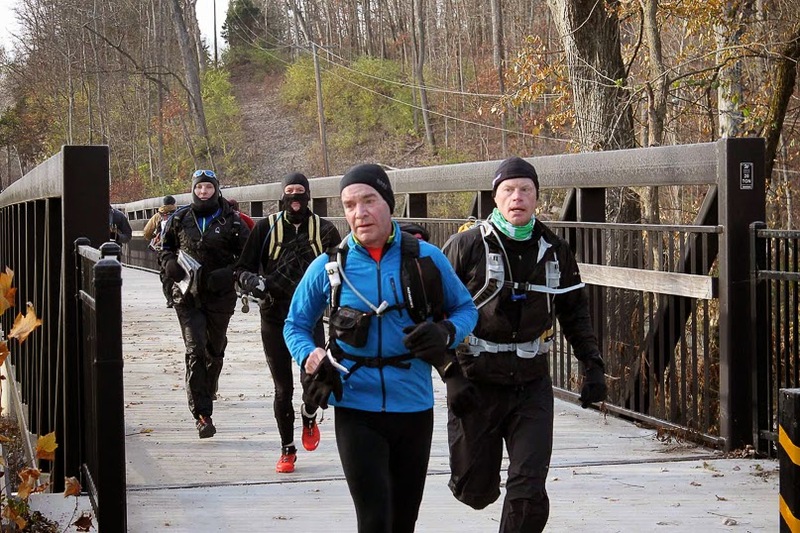 I've participated in 12 different adventure races with 6 distinct team configurations and 13 different teammates. 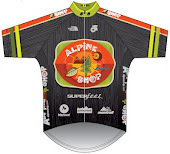 As you probably know, Jeff and David have been my main teammates since 2013, and when we need a fourth we call on our good buddy Doug to complete team Alpine Shop. 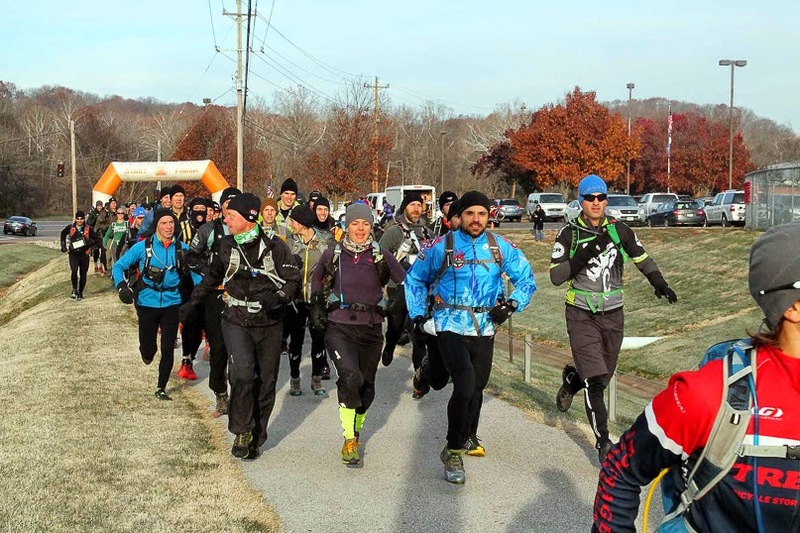 That was the plan for the 2014 running of the Bonk Hard Castlewood 8hr Adventure Race, the St. Louis area's largest adventure race. That is, until Doug's girlfriend Sunny (of WHOA! fame) started kicking serious UCI cyclocross boo-tay and needed Doug's crewing skills at Jingle Cross...on the same weekend as CW8. Finding a replacement for Doug isn't easy, and we had a tense few days calling around to different folks. Finally, we convinced Erl (of GearJunkie/WEDALI fame) to make the long trip south to race with us. I've raced with Erl a few times before, and each experience is a highlight of my short AR career. There are very few people who know how to support and foster teamwork the way Erl does, and I was so excited for Jeff and David to get to experience that. 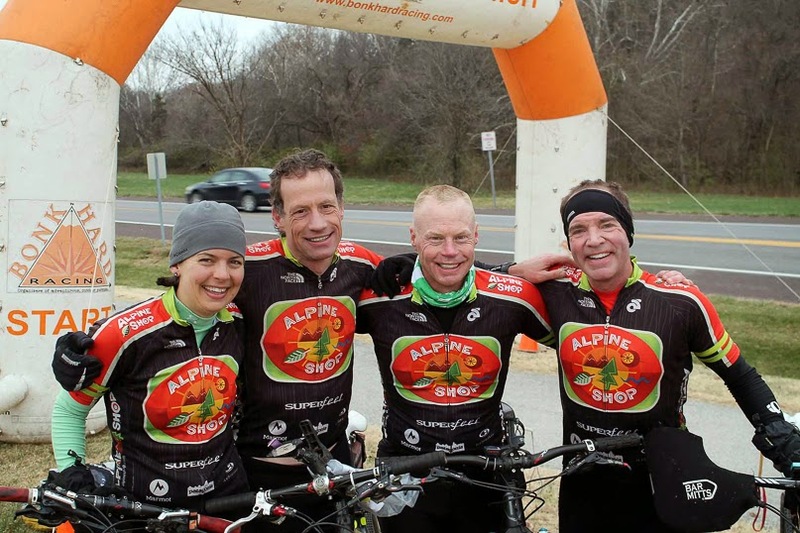 We've been able to hang out a bunch this fall in conjunction with other races (Berryman and Perfect 10) and each time I've gained more and more appreciation for Erl's experience and perspective on adventure racing. So, basically, I was super excited to see him again! Erl rolled in to the Alpine Shop around 4pm just as the place was starting to bustle with friends and family and adventure racers. We got all checked in with Bonk Hard and then picked up my traditional pre-race meal of Dewey's pizza before heading to David's workshop to prep maps. However, we didn't have any CPs to plot and only information on the first 2ish hours of the race. The biggest decision we had to make was which shoes to wear for the start...trekking or biking? Trekking shoes would be faster on the opening 2mi run, but would take longer to change after the paddle. Biking shoes would be a bit slower at first but then faster in TA. We hemmed and hawed and eventually (much to my relief) decided on trekking shoes. Then we ate a ton of pizza (seriously...the four of us polished off two 17" pies) and toured David's shop. Then Erl and I went back to my apartment and piddled with gears, a classic Alpine Shop habit. I took some time to look at the race area on Google maps and noticed there were two parks on the south side of the Meramec River (West Tyson and South Castlewood) that had orienteering maps. I guessed that maybe we would be given a surprise map sometime early in the race, and texted Jeff and David to let them know. Thankfully, we had already planned to wear trekking shoes so it wouldn't be a big deal either way. Jeff, Erl and I at the bike drop on race morning. Photo by Stacey Hagen. Race morning was early and cold. Erl and I met Jeff at the bike drop in Castlewood at 0630 and it was in the low 20s. We dropped off our bikes and biking gear at the beach, and then drove over to Race HQ at La Salle Middle School. The school had its doors and bathrooms open for us, and it was so nice to have a warm place to get ready. 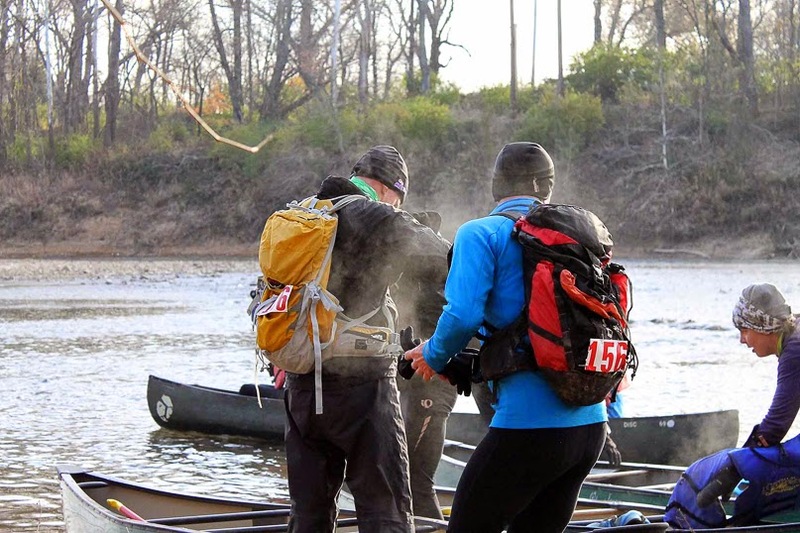 About 10 minutes before the race started, Jeff noticed his passport pocket (custom-made of course) was attached in the wrong direction on the shoulder strap of his pack. To most people, this would not be a big deal, but in a sprint race where every second counts, we were worried. Thankfully, we just needed scissors and 2 new zipties to fix it, so we sprinted across the parking lot to Jeff's van, perform some lightning-fast pack surgery, and sprint back to the start line with a few minutes to spare. Team Alpine Shop among the top 5 teams at the start! Photo by Mary Welter. We take off in a herd of racers...172 to be exact...and immediately I'm so glad we chose to wear trekking shoes on the paved path. We let other teams set the pace and are quite content to sit somewhere in the top 10 overall. Jeff punches the CP1 cleanly and we take off to CP2. Here, the path turns to gravel and we start to encounter some Saturday morning dog-walkers who are a bit confused to see a mass of pack-wearing people barreling down on them. We pass them as politely as we can on the out-and-back run to CP2. I love out-and-backs early in races because they let us cheer for a lot of teams, and today is no exception. I actually get super out of breath from yelling "good job!" so much so I try to hide behind David to recover. We reach the end of the trek and tumble down the hill where all of the boats are staged. Jeff, Erl, and not-a-serial-killer David running to CP3 with Nathan from Toporadicals. I'm just out of the picture. Photo b y Patrick & Donovan Feder. It's basically mass chaos, but somehow we manage to collect 4 (short) paddles, 4 PFDs, 2 canoes, and 1 punch of CP3. Oh, and....SURPRISE! 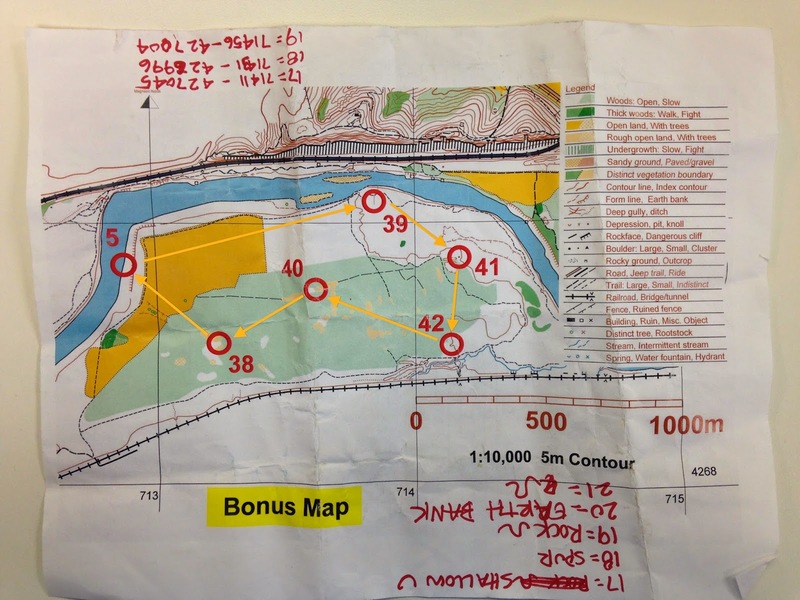 The volunteer hands us a bonus map which adds an unannounced trekking section to the middle of the paddle. Unfazed, we put in with minimal fuss and get paddling. At the put-in. Steamy. Photo by Patrick and Donovan Feder. 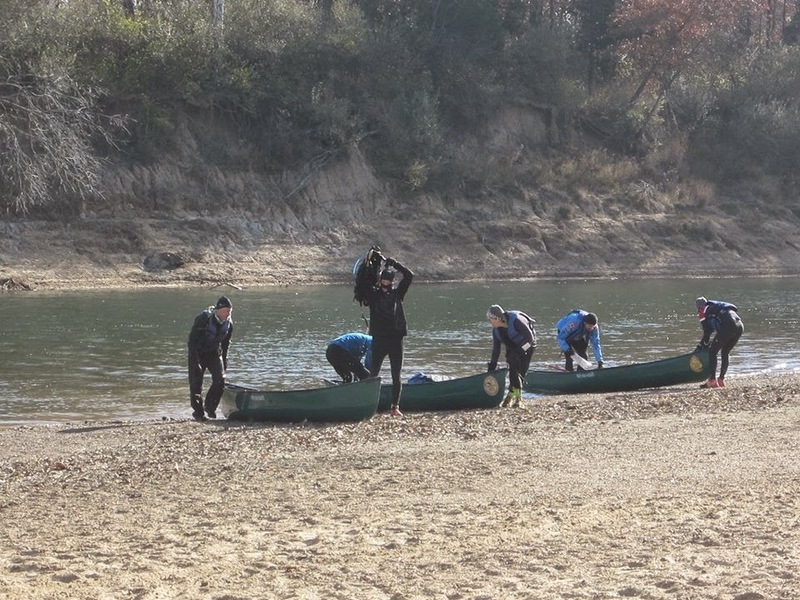 We're in the mix of the top 5 teams as we start paddling downstream on the Meramec. We're in our planned pairs, me in the back with Jeff and Erl in the back with David. I'm using my super-warm ski mittens to avoid the frozen hands like last year and so far they're working great, even as the spray from the paddle starts to freeze on the gunwhales and thwarts. It's really a beautiful morning to be on the river, and I use all my concentration to keep the boat on the most efficient line. Jeff and I can't even enjoy our usual chit-chat because everytime I try to talk, the boat starts drifting one way or the other, so I just keep quiet and focus. We don't pass many boats, and a few others creep up into our loose pack, and I try not to get frustrated and just stay smooth. We punch CP4 at Sherman Beach and get back out into the main channel. Pretty soon, we start seeing the boats in front of us land at CP5. We get there quickly and do the same. Both Jeff's and my packs are soaking wet, but for some reason I don't even feel the chill when I throw it back on. This is the map we were handed at CP3. I added the orange arrows showing our route. Also ignore the red scribbles, that was from later in the race. We negotiate our way up the steep earthen bank with 5-6 other teams and take off on a clockwise loop for the five surprise/bonus trekking CPs. David's decided to route us 39-41-42-40-38, and we join a pack of teams on the trail run to 39. This entire map is a flat flood plain with only a few mapped vegetation features and basically one contour line to navigate off of. It's like a big group run until we get close to the CP, and then everyone fans out to try and spot the flag first. We're a little discombobulated attacking CP39, but as we leave the circle, Erl organizes us into "formation" and the rest of the CPs are much better. We don't gain much of a gap on any team, but we're moving well through the vegetation. Once we've punched all 5 bonus CPs, we run across a field of tall, dead grass, take a group pee-break, and hop back in the canoes. Somehow, even though we've been running with about 5 other teams, we get onto the water in the lead! 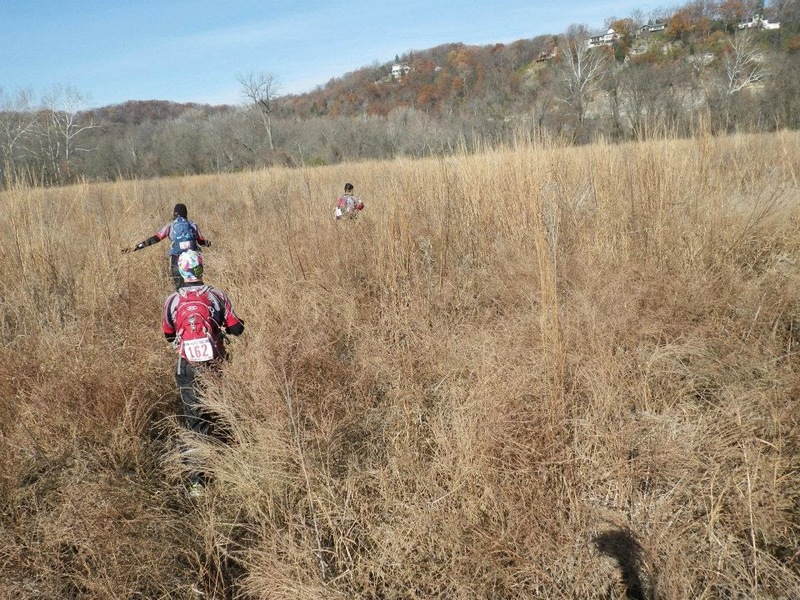 Our friends on Team Virtus running through the field on Trek 2. Photo by Bob "Lifeskillz" Jenkins. 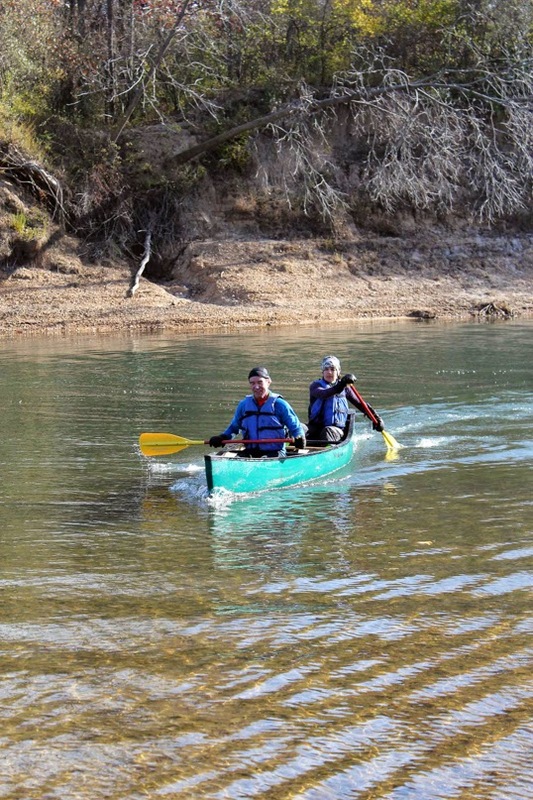 Jeff and I finishing out the paddling section. Photo by Patrick and Donovan Feder. Just because we're leading for a moment, doesn't mean it's easy to stay there. Jeff and I make it a little harder on ourselves because we accidentally picked a different boat than PADDLE 1. It wouldn't be a huge deal, but one of the paddles is extra-long so Jeff takes it, but has a hard time keeping high cadence. "It's like paddling in the big ring!" he says, but gets it done anyway. Stud! We have 2 other boats for company through the first little congested section but I focus really hard on keeping my line and no-one dumps, although David and Erl tell us later that they came scarily close. This paddle is shorter than the first, so I work really hard to keep the boat moving as fast as possible. Finally, the Castlewood beach appears and we take-out with about a 30-second lead on Team CRX and AMTZ, and Toporadicals, 36 Down, and Extreme Electrical not far behind! CP6 has a gear check which is more mass chaos, but the volunteers do a great job at managing everything. A lot of teams opted to do this race with flat pedals, but we all take a bit of extra time to change shoes, hoping that our feet will appreciate being dry and warm after the paddle. At the take-out, with AMTZ hot on our sterns. Photo by Stacy Hagen. Getting ready to start riding, I'm helping Erl put on his glove. Photo by Donovan and Patric Feder. We've got a loop of Castlewood singletrack, and the route is pretty much the best-case scenario for me (keeping the most technical bits on the uphills instead of the downhills). We roll out, now firmly committed to our formation, but no idea if any other teams made it through the gear check more quickly than we did. We can't see anyone ahead of us, but that doesn't mean anything with the quality of the teams we're racing today. We get to work climbing Grotpeter, motor through Roller Coaster, and descend smoothly down Love. The trails are starting to thaw and get greasy as we hit the short out-and-back on the dirt crit loop, but we all keep the rubber side down as we knock out the last CPs on this leg. Then it's into TA where we will be given maps for the rest of the course! As we approach the shelter, we spot AMTZ already there, so we know we're a few minutes down in second place. 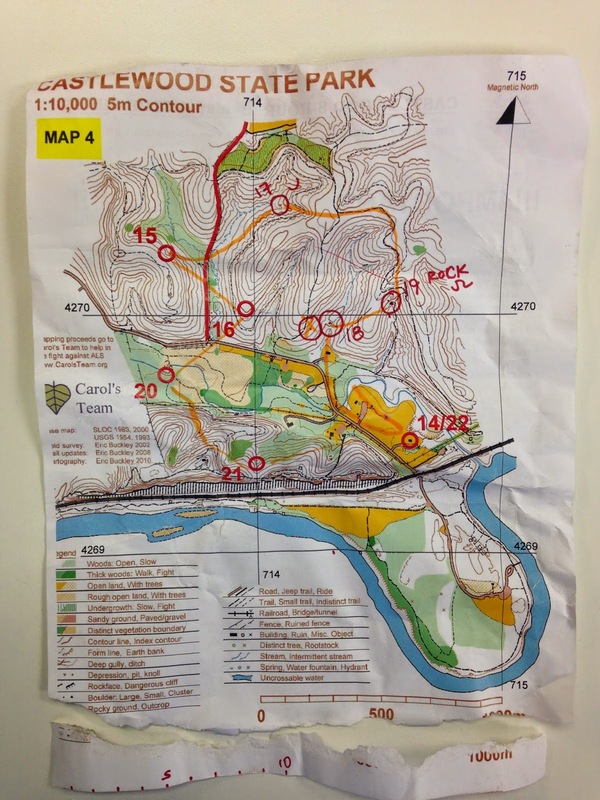 We punch CP14 and the volunteer hands us a map with instructions for 8 trekking CPs, 3 of which we have to plot ourselves. This isn't a big deal, until David digs around in his pack for our plotter and discovers it fell out at the gear check! We allow ourselves about 5 seconds of panic, and then Jeff tells me to make a plotter out of paper like we did at the Berryman 16hr. I rip off a piece of the map and use the printed scale to make a rudimentary plotter. David calls UTM coordinates and we slowly get the 3 CPs transferred onto the trekking map. I'm not even sure if they're right, but we have to leave NOW if we're going to have a chance of catching AMTZ. The map for Trek 3. We ripped the bottom of the map off and used it to plot 17, 18, and 19. We storm out of TA on a mission, but I'm really, really scared about the 3 CPs we just half-assedly (is that a word?) plotted on the map. As we attack CP18, I'm expecting the worst, but to my relief Jeff spots the flag quickly. 1 down! We climb the spur to CP19 and descend into the reentrant, looking everywhere for the flag. Nothing. I yell that we need to re-check the plot right away, but at the last second, David spots the flag and gets the punch. 2 down! I'm feeling slightly more optimistic on the way to CP17, and sure enough, the David leads us straight to the shallow depression. 3 down! I'm SO RELIEVED that we've got these out of the way, and now only have the pre-plotted CPs left. We hit CP15 next, overrunning the side reentrant slightly, and as we descend back down after punching, we spot AMTZ approaching. Erl and I try to adjust our route to not give away the correct reentrant, but it doesn't really do any good. We cross back over Ries Rd (legal to cross but illegal to run along), climb up to CP16, and then run back down to CP20. We catch up with AMTZ here because they took a slightly different order (17-16-15-20) and we all meet up at the creek crossing. David, sensing an opportunity, leads us straight through a knee-deep section of the creek while AMTZ chooses a slightly longer and dryer route. Our feet are now soaking wet but we're in the lead! Here is a different team crossing the creek at CP20. We had crossed earlier in a deeper section, and then crossed here as well. We were not this careful. Photo by Patrick and Donovan Feder. We all know this could be a make-or-break moment and I have a flashback to the 2013 MNOC Tune-Up where I was in a similar situation, racing with Biz. In that race, he gave me an awesome (-o-possum) pep talk that inspired me to dig deep, so I try to do the same for my team today. "Guys, we have a gap, we have to push it super hard up this hill and make it stick!" We charge up the backside of Lone Wolf, everyone red-lining in an effort to gain the lead. In between gasping breaths, I try to encourage as much as possible, and we make it to the top of the hill having opened up a slight advantage over AMTZ. We crash down the other side, David picks the correct reentrant for CP21, Jeff punches, and we race back to TA with about a minute's lead. Back at the shelter, the volunteer hands us an entire packet of maps for the remainder of the race. It contants four 8.5x11 maps, double-sided, with 12 CPs scattered among them. It's really confusing to make sense of everything and plan a route to the finish line. David and I work together to get everything sorted, reading the clue sheet again and again to make sure we're doing everything according to the rules. Meanwhile, Erl and Jeff complete their TA and then help change David's and my shoes so we can leave faster. Finally, we think we've got it all figured out and hop on bikes, leaving in 1st place! 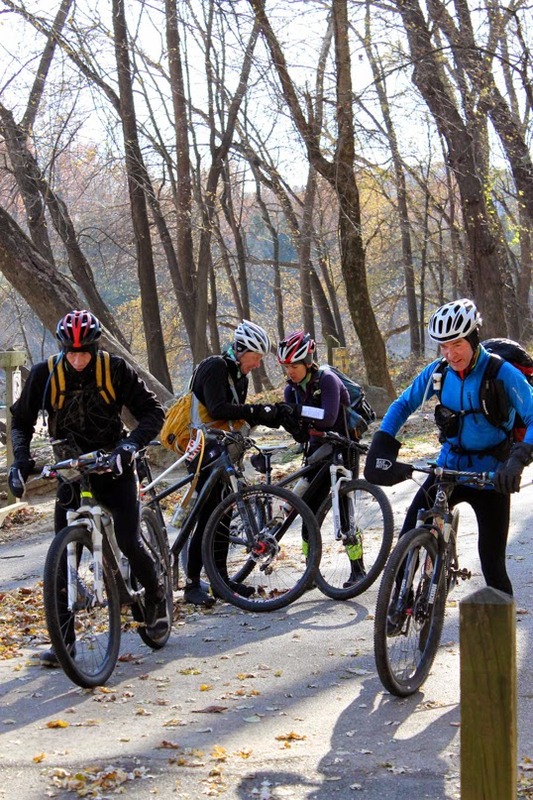 We know AMTZ is stacked with really strong bikers, so we organize into a towing paceline and hustle out of Castlewood State Park. The first three CPs (23-24-25) must be found in order, and David guides us smoothly to each one. Then we have a bit of a route choice, and, after further analyzing the map as we're riding, David decides to change his original plan and go 27-28-29-30-26, and then head into the west side of Castlewood for 31-32-33. We ride across Ridge Rd and descend down the paved Rock Hollow trail to CPs 28 and 29. On the way down, we actually see CP30 hanging in the woods, but race rules say we must bike to it (no bike-whacking allowed on this land) so we ride down to the Zombie trail head (CP29) and then take the singletrack uphill to the flag. This singletrack is newly-built by GORC and it's a really fun ride. We get the punch, ride the trail back down, and then take the Al Foster path to CP26 and continue into the west side of Castlewood. The three controls on the west side of Castlewood are really fun. The singletrack is straightforward and fast, and we're all still feeling decent. David guides us smoothly to each CP and we're out of there in a flash. Once we're back on the Al Foster, we know we just have a mile to the CP34 and the finish line. Time to empty the tanks! The boys each take turns pulling while we absolutely fly down the path. Pretty soon, we spot the iconic orange and white Bonk Hard Racing inflatable arch signifying the finish line. We ease the pace just slightly to make sure everyone's together and cross the finish line with huge smiles. Big smiles at the finish line. Photo by Mary Welter. It is incredibly satisfying to finish 1st at the Bonk Hard Castlewood 8hr AR. Sprint races are so stressful for me, since one mistake or mechanical can derail an entire race, where as in the 24hr races you have more opportunity to recover. We did make a few mistakes out there, we always do, but each one was small and we were able to recover quickly. That's the value of racing with three highly experienced teammates. Even though all of our transitions were chaotic, we were always communicating and trying to help the team as a whole. We were constantly checking on each other, making sure that no one was getting too cold or hungry or blown-up. When we had the opportunity to grab the lead, we all recognized it and had the legs to make it happen. It is so great to see a huge field in an adventure race, and we enjoyed the intense competition from several speedy teams. Everyone was so positive and encouraging, even when we were trying to rip each others' legs off. That is the spirit of adventure racing! Something else pretty cool happened, a group of students from Mizzou was at the race, filming and photographing and later interviewing racers for an article on the sport. I'll post the link to that as soon as I have it, and hopefully we can draw even more athletes into our AR community! If you are a beginner racer and have questions, please use the Contact button at the top of the page to get in touch with me. I love talking to new racers!